The founder of Ninben, Ihee Takatsu, was born in Yokkaichi, Sesyuu (in present day Mie Prefecture) in 1679. In 1691, he moved to Edo's Kobunacho and became the apprentice of a grain trader named Tarokichi Aburaya . When he was 20 years old in 1699, he then began trading in katsuobushi and shioboshi (salted and dried fish) at two side-by-side stalls in Dotegura of Yokkaichi, Nihonbashi, near the present day Nomura Securities head office in Nihonbashi 1-chome. That year is considered to be the year of Ninben's establishment. Later on, in 1704, he opened a wholesale store in Kobunacho. In the following year, he changed his name to Ihee and the name of his shop to Iseya Ihee. He then started a retail store in Setomonocho, Nihonbashi (present day Muromachi 2-chome) in 1720, which is now the location of the current Ninben head office. In 1705, the founder named his shop Iseya Ihee. To make the kane-ninben trademark, he combined a part of one character from his name and the name of the shop (イ) to form a right-angle gauge（T）, a symbol that means "doing business in an honorable way," as well as meaning money. The idea of Mitsu-Kaneninben is something that has been passed down within the company for a very long time. The first means the customers who use katsuobushi. The second means the people who produce it. The third means the people who engage in its trade. We place great importance on the idea that it is possible to do business only once a relationship of trust between these three groups is established. In terms of a sustainable society, this is also an idea that harmonizes with today's society. 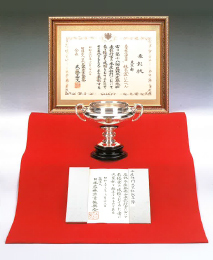 In 1979, Ninben was awarded the Emperor's Prize at the 18th Agricultural, Forestry, and Fisheries Festival for the development the Katsobushi Fresh Pack, the open sharing of its production process, and creating an increase in demand for katsuobushi, and also for its contribution to the expansion of the industry and promotion of stable management in the bonito fishing industry. Founder Ihee Takatsu is born on March 17th in Yokkaichi, Sesyu. His childhood name is Inosuke. Ihee, full of resolve, at the mere age of 12 he goes to Edo and becomes the apprentice of Tarokichi Aburaya, a grain merchant in Nihonbashi's Kobunacho 1-chome. At 18, his exceptional business abilities, perseverance and honesty are recognized, and he surpasses his seniors and colleagues to succeed in going to Kyoto and Osaka. Ihee's progress gradually attracts jealousy from his peers, and he feels harassed by his superiors. While his hard work enables the business to thrive, disputes and arguments with the spendthrift master leave him unemployed and penniless. At 20, Ihee begins selling katsuobushi and shiobushi (salted and dried fish) at two or three side-by-side stalls in Dotegura of Yokkaichi, Nihonbashi (near the current head office of Nomura Securities). This year, the 12th year of the Genroku era, becomes the year of Ninben's establishment. The anniversary date is on the founder's birthday, March 17th. Ihee toils day after day on an empty stomach in the harsh summer heat and cold of winter. In five years, he saves 200 ryo and begins doing business with the wealthy merchants in Kobunacho 3-chome as a wholesaler of katsuobushi. His quality products and competitive prices earn him prosperity and a reputation as a genius up-and-comer merchant. He moves to Setomonocho (Muro-machi). This becomes the head office. The founder writes on a signboard in large characters the message"Pay in cash and you won't be overcharged." The third successor takes the name of Ihee Takatsu. He secures orders from powerful daimyo lords, including Lord Maeda of Kaga. Ninben donates mochi (sticky rice cakes) to the victims of the Horeki era's large fire and is given a crest by Lord Kuroda of Chikuzen. During the time of the sixth head of the family. Iseya Ihee is referred to as a wholesaler of katsuobushi and salted and dried fish in the Edo Kaimono Hitori Annai (A Personal Guide to Shopping in Edo), which is now held in the National Diet Library. The seventh head of the family befriends highly cultured scholars and artists, like Ota Shokusanjin and Eisen Kanou. He possesses many masterpieces of national-treasure status. He also lives up to his name by establishing himself as one of Edo's great merchants. The eighth head of the family is made one of five purveyors to the Tokugawa government by an accounting magistrate and is given permission to have a family name and two swords. 1904 Ninben becomes the sole supplier of katsuobushi during the Russo-Japanese war. 1944 The store is destroyed by fire during World War II. 1948 A new store is constructed. 1960 Trading business is started. 1964 The popular Tsuyu no Moto is developed and sold. 1969 270th anniversary of establishment. The Katsuobushi Kezuribushi Fresh Pack is the first of its kind in the industry to be sold. 1972 The Fresh Pack becomes a hit product. 1973 The 12th successor assumes Takatsu Ihei's name. The head office building is completed. 1979 280th anniversary of establishment. Ninben receives the Emperor's Prize in the fisheries category at the 18th Agricultural, Forestry, and Fisheries Festival. 1997 The Hongare Katsuobushi Fresh Pack receives the Minister of agriculture, Forestry and Fisheries Prize at the 46th National Fisheries Processed Food Exhibition. 2003 Ninben acquires ISO9001:2000-HACCP (November 7, 2003). 2009 310th anniversary of establishment. Katsuyuki Takatsu is appointed as President. 2010 Main store moved into Coredo Muromachi. Nihonbashi Dashi Bar launched with the concept of "one soup, one meal". 2014 On the 315th anniversary of establishment. Head office moved to Muromachi Itchome in Nihonbashi. Restaurant business launched.